Linda is a founding member of Chinle Valley Singers, a family of seven ranging in age from 18 to 56, who preserve Navajo tradition in song and dance by adapting ancient ceremonial arts to social and entertainment venues. Rooted in rich traditional music but including new songs composed to the traditional bar, these dances are associated with skills for eking a living from the desert – sewing, cooking, riding horses, herding sheep – the music of her mother’s elders. Native dancing today is a mixture of the ceremonial and social, its purpose to gather energy for healing, usher people through stages of life, encourage closeness between generations, promote responsibility – and also to have fun. Since dances need no longer be held in secret (Indian dancing was illegal in parts of the U.S., Mexico and Canada from 1680 – 1951), alongside the explosion in powwow, many people around North America are organizing troupes that educate and entertain. In the Southwest, Spanish prohibitions against dancing began in the 17th century in what is now New Mexico. Fear of Indian ritual and an impulse to Christianize struggled against common sense for more than 200 years. While the U.S. government’s ban on Indian religions, 1884 to 1933, targeted the plains – the Sundance and Ghost dance primarily – effects spread to all other aspects of native religion. At the heart of the Sundance, performed near the time of the solstice and containing fertility and warrior elements, is a cyclical view of time. It emphasizes the minor roles human beings play in the great mystery of life on earth. William F. Cody, who served as a Union scout in campaigns against the Kiowa, Comanche, and Cheyenne, and gained his reputation as “Buffalo Bill” in dime novels, brought Natives to the stage in an outdoor extravaganza, “Buffalo Bill’s Wild West” in 1883. This show included an Indian War Dance with real Indians and culminated in “Custer’s Last Stand” with a few Lakota who had fought in the battle playing parts. A mélange of history and schmaltz, this show was a huge success, touring North America for three decades and playing to crowds across Europe. Unlike so many Native American tribes who were forcibly removed from their homes, Apache continue to live on land located within their traditional territory. Still, knowledge of many ceremonies is lost. Surviving practices orient toward healing – in the past for an individual who had broken a taboo or offended a spirit – today taking place deep within the individual – opening him up, making him aware, bringing him into real contact with the power that created the universe and is manifested in nature. The Changing Woman Ceremony, for example, endows pubescent girls with strength and longevity that spreads into the community, lasts days, and incorporates a number of significant dances. Traditionally Navajo dances marked a particular occasion: a baby’s first laugh, a young woman’s emergence into puberty, the taking on of new roles by older women. “The Squaw Dance started,” says Linda Davis, “when Monsters were plaguing the People, destroying crops and defacing the land. Two Twins, identical sons of different mothers, went to their father, the Sun, to get medicine. They returned from the East with the bow and arrow, but the terrible battle made the Men sick in their bodies, sick in their minds. Women performed a ceremony of healing for them.” Davis hesitates. “This dance is still used to heal veterans. We call it Squaw Dance, but I think the word comes from the whites,” who may have used it to distinguish it from dances for men. “On the reservation there is a Sacred Tree, an ancient tree struck by lightning three times but still living,” says Duncan. “The earth beneath it is holy ground. Before the Warriors left the reservation for Vietnam, the Sand Painting ceremony was held there. Both Indian and non-Indian families showed up, bringing photographs and articles of clothing. 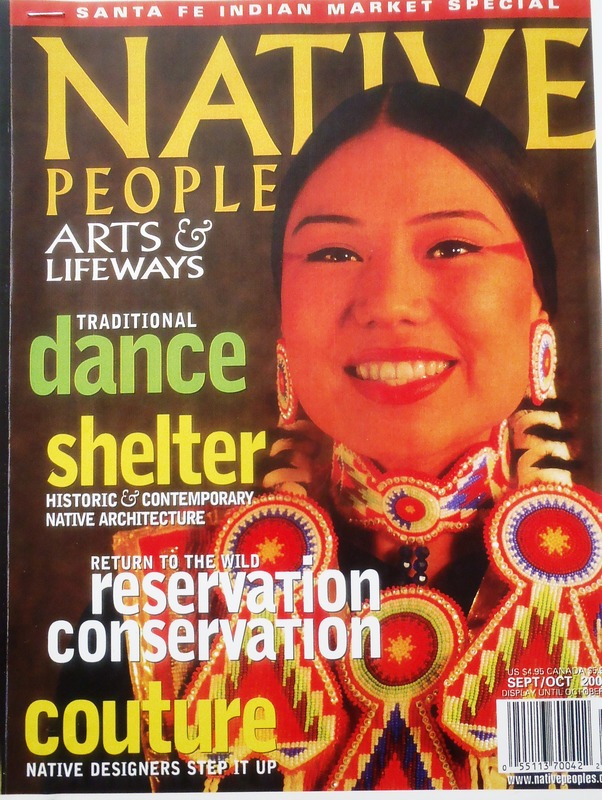 Choreographers like Ted Shawn (in the 1930s), Rosalie Jones (Blackfeet/Pembina Chippewa), Belinda James (San Juan Pueblo) and Hanay Geiogamah (Kiowa/Delaware) create dances for professional companies illustrating Indian cultural and ceremonial life. Even more common are family groups such as the Chinle Valley Singers and Yellowbird, or tribe groups like Le La La Dancers, who earn awards, perform for presidents, and tour the world educating children and adult audiences about what it means to be Indian. Chinle Valley Singers began assembling regalia for performance in 1981. “People respect jewelry,” says Linda Davis. Stones are protection; when we wear turquoise the spirits recognize us. We keep our hair long and braided. This is part of what makes us Navajo.” The group has a dozen different outfits, each made of different materials. One is velveteen with 32 tiers of silver buttons. Another is a rug dress, hand-woven from wool in the “dark clouds” design. is one reason why dance has not only survived, but thrived. In the Kwakwaka’wakw language Le La La means ‘moving from here to there.’ In 1987, George Taylor, a social worker in Vancouver British Columbia whose father is hereditary chief of the Kwakwaka’wakw people, moved to the tribe’s rural center, Victoria Island, to allow his sons to become familiar with the people and proud of where they come from. Taylor learned from his father – who learned from his own father – Kwakwaka’wakw cultural values and traditions. One value is dancing in a traditional potlatch, put on by chiefs for healing, totem pole raising, naming children, honoring the dead and presenting masks. The chief offers gifts to the guests, demonstrating his sacred duty to each individual in the tribe. Because Canada’s government once outlawed potlatches, only recently have chiefs given permission for people to share elements of potlatch culture outside the tribal environment. Sporting family crests and button blankets, Le La La Dancers performs shortened versions of 20 traditional dances, like Raven, Echo, Blessing of the Headdresses, and Spirit of the Masks. They explain to the audience where each dance comes from and how it teaches respect for oneself, tribe, and Mother Earth. Begun in 1986 by UCLA Professor and Great Performances writer Hanay Geiogamah (Kiowa /Delaware), the American Indian Dance Theatre assembled a professional company crossing tribal lines. Its current production, “Dances from a Tribal Life” presents dances performed for hundreds of years, some with original choreography reflecting the present, and combining old Indian songs with contemporary music. Before adding traditional dances into its repertoire, AIDT first gets permission from tribal leaders, often asking elders to teach intricate steps and advise about regalia and music. “Whenever we add a new piece, we first make sure that there are no religious restrictions to performing that dance in public,” says Geiogamah. The United States, unlike many other countries, does not have a national dance company. Many people believe the honor and responsibility of this distinction should go to a Native troupe. AIDT, Le La La, Yellowbird and Chinle Valley have all toured the U.S. and Europe. AIDT has performed for PBS, Chinle Valley in movies. Yellowbird has danced for U.S. presidents, and at the Smithsonian’s Museum of the American Indian. Le La La is hosting Canada’s National Aboriginal Dance Symposium 2006, and all four troupes are touring this year. By Miriam C. Jacobs in COVER STORIES on September 2, 2006 .